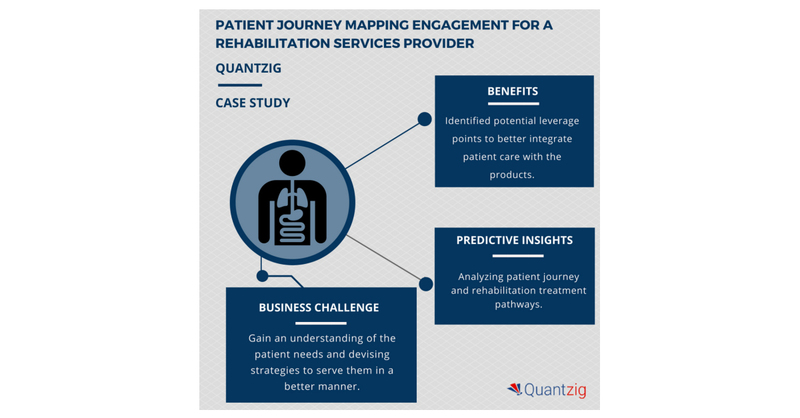 LONDON–(BUSINESS WIRE)–Quantzig, a pure-play analytics solutions provider, has announced the completion of their latest engagement on patient journey mapping for a leading rehabilitation services provider. The client, who is one of the largest university-affiliated academic centers entirely devoted to outpatient and inpatient rehabilitation medicine, wanted to gain comprehensive insights into rehabilitation services pathways and the issues that a large proportion of their customers and potential healthcare personnel were facing. Rehabilitation services companies offer physical therapies, treatments, and activities to help patients recover and improve physical and psychological difficulties following an injury or ailment. Some of the key factors fueling the growth of this industry include the rising number of people with disabilities and the baby-boomer generation that is fast approaching coupled with chronic conditions, cardiovascular diseases, and stroke. The patient journey mapping engagement helped the client gain a comprehensive understanding of the patient needs and devise strategies to serve them in a better manner. The client was also able to effectively target their customers and maximize the reach of their products and services.